An author from Colby just finished his first book, about a preacher obsessed with quantum physics, based in part on his expe­riences here. 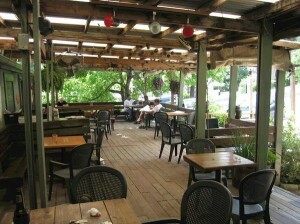 “Growing up in that country out there has influenced everything I do,” said David Piper, who now lives in Austin, Texas. Piper said he moved to Colby when he was 8. While living here, he said, he learned about both telephones and fiction writing. He recently finished his first novel, “Church of the God Particle,” based partly in Colby from the 1960s to the 1980s. One of the main characters grows up in Colby, attending a fictional Catholic church which houses an orphanage and has a different name. Along with his life in Colby, Piper said, his career in telecom­munications helped inspire his book. After graduating high school in 1972, he went to Colby Com­munity College for several years. During that time, he worked for Bell Brothers burying telephone cable. He went to the University of Kansas in 1974, but dropped out. Then he was a repairman for Southwestern Bell in Lawrence for 11 years. “Going in and out of people’s places, I met some really odd peo­ple,” he said. He went back to school in Law­rence in 1989 and finished a tele­communications degree in 1991 at the Northwest Kansas Techni­cal School in Goodland. Then he worked for telecommunications companies in Memphis and Co­lumbus, Ohio, before ending up in Austin, working for a company called Grande Communications. He helps program computers to run a telephone network. Watching computers at work to help people making phone calls was a big inspiration for his book, in which the main villain tries to absorb a new technology into his body. He said also developed a love of writing early on in his life, starting with a short story he wrote in a high school class taught by Jack McCraken, who was also the football coach. “I’m not saying it was very good, but I thought that this was something I like to do,” he said. 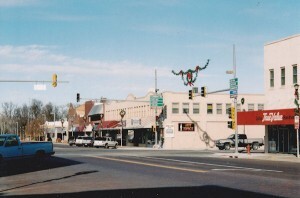 Working at Gibson’s Discount Store, then next to Pizza Hut, during high school, he wrote short stories on rolls of cash register paper on nights when he closed the store and had nothing else to do. “I’d have three or four feet of cash register tape and a story that I’d written,” he said. He said he spent a lot of time painting in Lawrence, including landscapes, and the main pro­tagonist is a landscape painter who lives on a ranch. The wide-open landscape of the High Plains helped him write a book that was 354 pages long, he said. The novel, which is indepen­dently published, is available at major online outlets such as Amazon, Barnes and Noble Kindle and iTunes. The St. Augustine grass in my front yard turned brown, got crunchy, and then died. The view from my writing window grew more depressing as each day passed. What if the baked desolation outside were to creep into my prose? I thought about starting a bleak, dystopian novel. 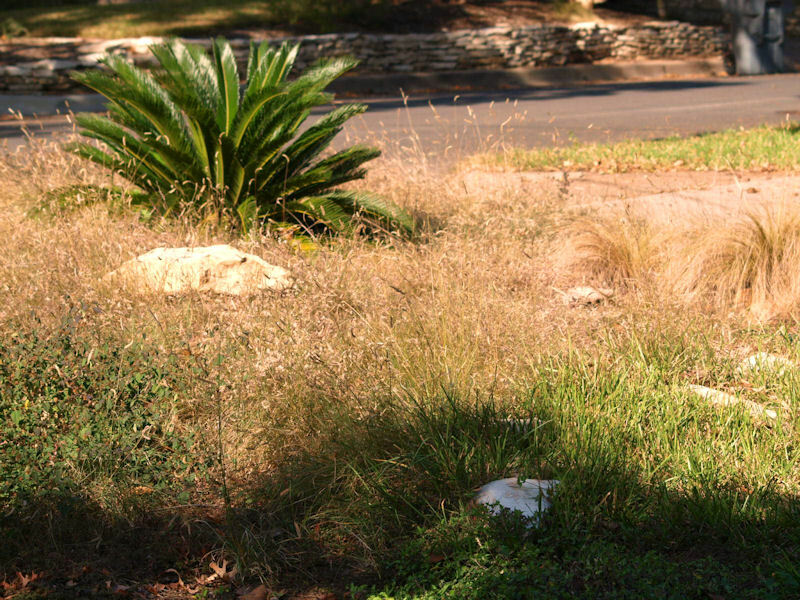 When the drought of 2011 finally burned away the last green leafy runners of St Augustine grass and left me with bare dirt, I threw myself at the feet of the experts from the Lady Bird Johnson Wildflower Center and pleaded for horticultural enlightenment. “Say what?” I asked. I thought perhaps the heat had affected my hearing. 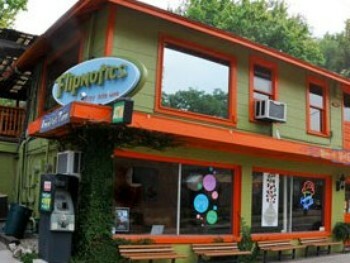 “Habiturf has taken years of research and field testing to develop,” the friendly lady in the Center’s store said. It’s the hardiest, most drought-tolerant grass for this part of the world.” The store had puffy little cloth bags stacked neatly on a table with a little pamphlet stapled to each one. Inside the white bags was a potent mixture of mostly buffalo grass with a combination of other prairie grasses. “We’ve tried to replicate how nature intersperses seeds on America’s plains,” the LBJ Wildflower lady said. “Don’t plant this stuff anywhere near the shade,” she instructed. Perfect for my yard, I thought. Perhaps my optimistic writing voice would reemerge! I imagined tall grass gently waving in the breeze outside my window. My dystopian novel would have to wait. I stacked my just-acquired rocks near a skin-puncturing sago palm, a species that hasn’t evolved in 200 million years. Surrounded by a sea of Habiturf, the limestone island and the sago palm reminded me of a prehistoric savanna in the movie, Jurassic Park. All it needed was dinosaurs. I hopped on my bike and pedaled to a nearby toy store and bought a couple of nine inch plastic Tyrannosaurus rexes and posted them on the rocks so they could gaze across their domain. 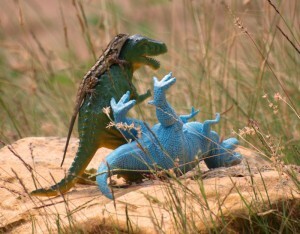 Liz had climbed onto the back of one of the plastic dinosaurs for a better angle to the sun. I started laughing and dashed into the house to get my camera. There was no way to get close enough for a decent shot, so I screwed on a telephoto lens to my Olympus. When I flew out of the porch I let the screen door bang and scared Liz off its perch. My once-in-a lifetime shot had disassembled itself, and my little friend scurried back under the rock. I wailed like a cornered T-rex prey. I vowed to get that photograph. As I proceeded to write my non-dystopian novel, my Olympus, with its long lens attached, set on the corner of the desk. 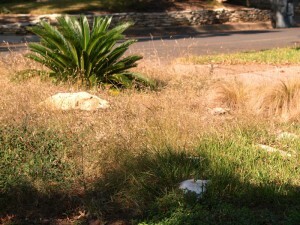 For two weeks my eyes strayed from the keyboard to the window that overlooked my front yard mini savanna. One of the T-rexes toppled over, perhaps from the wind or from a stray animal or bird. Or maybe he just lost his footing. One cloudless morning I saw Liz climb onto the rock and crouch at the feet of the green T-rex. For the next hour I was transfixed by the little reptile, but like the proverbial watched pot that refuses to boil, the lizard didn’t move. I got up to fetch a snack. When I returned to the window she was riding the beast! I could see her arms wrapped tightly around the neck of her mount, whispering in its ear as the two negotiated the path around their fallen rival. I grabbed my camera and dashed outside, but this time I caught the screen door. In a glass case at an historic northern California stone house lie pages of a typed manuscript by Jack London. I was struck by the lack of revisions. Only a few hand-scribbled pencil marks stood out on the otherwise clean sheet. The stone house was built by London’s wife, Charmian, after her husband’s death. It’s now a museum, dedicated to one of America’s great writers. And why so few revisions on the manuscript? Was Jack London such a natural writer that essentially he didn’t make mistakes or need to revise? Or perhaps I was looking at a nearly finalized sheet after its predecessor pages had been scratched up and discarded. One thing is certain: London was a prolific writer. But how could a person with such an enormous literary capacity and the ability to monetize it die of alcoholism at age 41? 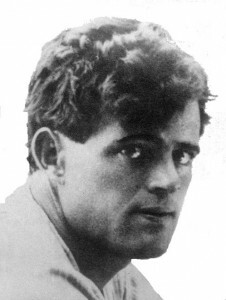 Jack London churned out 28 books, some masterpieces (and some not), before his death 1916. He traveled the world from Australia to the Klondike, fueling his creative tank with experiences from which he extracted rich prose. London logged time as a hobo, cannery worker, oyster pirate, and also fish patroller for the state of California. He was raised working-class; his stepfather was a farm worker. (His biological father abandoned the family before London’s birth and later denied paternity.) London excelled in self-promotion, and was one of the first American writers to amass a fortune. However, he firmly rooted himself in working class values and became an avid socialist. Herein lies the dilemma, according to many biographers, of the author’s discontentment. The novel, Martin Eden, was written when London was 34, and critics consider it one of the author’s best. It is the partially autobiographical story of a man who rises into the celebrity class, yet still identifies with his working class upbringing. Martin Eden, the protagonist, finds himself unable to cope with conflicting personal and societal values and commits suicide at the height of his fame. Eleven years before his death, London began buying tracts of land near Sonoma, which he eventually consolidated into his Beauty Ranch. The ranch was his passion, and he once commented that the primary reason he wrote books was to finance it. The museum in the old stone house has an eerie silent film clip of the author. His electric ghost awaits visitors, and animates at the press of a button. A laughing London tries to contain an armful of squirming piglets. One would never guess that the vital man in the film would be dead within days. In 1911 London and his second wife, Charmian, started construction on a ranch home they had dreamed about even before they were married in 1905. Adjusted for inflation, they spent the equivalent of more than two million dollars. But before they could move in, the place burned down. As he watched the blaze, London bemoaned not the loss of money, but the loss of beauty. After the fire he continued to travel and write despite deteriorating health. Finally in 1916 he died “suddenly” of acute kidney failure. And what about the lack of revisions on the manuscript in the glass case? Charmian London was an accomplished typist and editor. A measure of her husband’s success and enormous literary output can be attributed to her skills and devotion. Undoubtedly, she had a hand in polishing the manuscript.